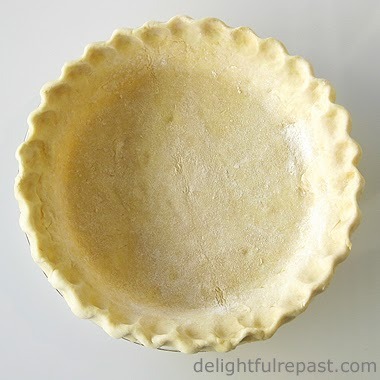 The pie crust looks perfect, Jean! And the quiche sounds so good. I've been substituting AppleGate nitrate-free bacon to avoid headaches and used it in our Christmas Eve clam chowder. And our favorite Cheddar lately has been the Kerry Gold Irish Cheddar (I think that's what it's called. I can't find the label now. Anyway it's an aged white cheddar and SO good!) Thanks for the recipe. Will try it soon. Thanks, Judy! I always get uncured, nitrate-free bacon, too, like AppleGate or Niman Ranch. 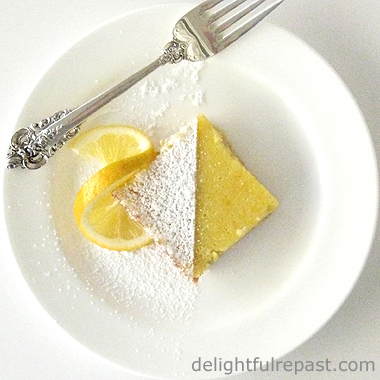 Let me know how the recipe turns out for you! It has been forever since I made quiche. You've inspired me, thank you! Our family always gets together for New Year's Eve, and this might be a great addition to the menu. Karen, thanks! I think it's a good thing to have when people are in and out and eating at different times, since you can have it in the fridge and heat up a slice in the microwave any time. Thanks, Liz! Everything's better in a pie, I always say! I haven't made or had quiche in a really long while, Jean. This looks so beautifully golden brown and inviting. Angie, thanks! I go years without making a certain thing, then I make it all the time for a while (probably overdoing it! ), then not, etc. Sometimes I think I should make a schedule! Thank you, Lavender Dreamer! Let me know how it turns out for you. “Pie weights” and “blind baking” – who knew? Thought I understood everything about pies, but I really need to study for my Boards before I’ll be certified. I mean, my pie nomenclature has terms like “glurp” and “thumb deep.” And I was flat out astonished to learn that you could SLICE a pie. Seems like a needless waste of time. I thought all servings were round and went from edge to edge, to be devoured in one sitting. But then you’re into that sampler stuff, sharing and presentation. I’m more into the eat-until-gone school of appetite appeasement. When you lick the plate clean, you don’t have to wash dishes. Just sayin’. Oh, yes, I like to slice it and present it properly. We won't talk about those few occasions when I've eaten a whole pie by myself, little by little, slice by tiny slice, all day long (to the exclusion anything else). "All pie, all the time" is not a bad motto! 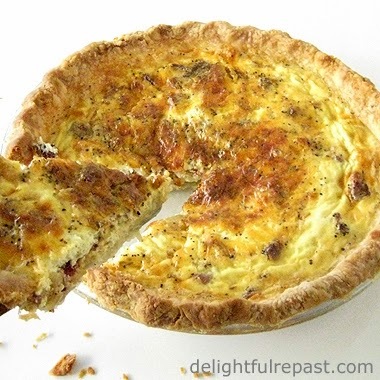 Ok, I've tried Quiche on a couple of occasions and I like it ok. Best when served warm. Cold? Well . . . not so much. But I bet this quiche is delicious right out of the oven. And yes, it just might be the bacon! I've made more recipes off your website Jean than probably any cookbook I've ever owned so who knows, someday maybe I'll even make your quiche! Richard, thank you so much! I'm glad you like so many of my recipes! I made this again last night, and my husband really enjoyed it. Amy, thanks! I hope you have a terrific 2014, too! Okay, Grant, you go ahead and put ketchup on it -- I'm not one to fight food traditions! Ruth, you can always make it for a little gathering of writer friends, right? Ee bah gum as uz northerners say. Reet tasty this one lass. Can't beat a nice quiche fer tea. Sounds perfect Jean. I like Italian versions with sum dried tomatoes and various herbs. But a good bacon and cheese one does very nicely. Thanks, Tony! We love dried tomatoes, too. Reet tasty, laddie! And the great thing about quiche is that you can use what you have. I'm out of dried tomatoes just now; used the last of them for a focaccia. Great looking pie crust and quiche Jean! I didn't have a quiche in... well, years! Wow, can't believe it was so long! Thanks, Charles! I like that - 'If I can't [rest], why should the pastry be allowed to?' :D I certainly had no rest today in the kitchen, but fortunately my sweet husband came in and did the cleanup! Thanks, Tanna! I do that, too -- make something often (maybe too often!) then not again for a long time. I love quiche. Its easy, versatile and my whole family will eat it without complaining, Such a win.